NaturPlac is one of those special places where you will end your activity-packed day by gathering with your family or friends around a fire and build new bonds with other nature lovers. 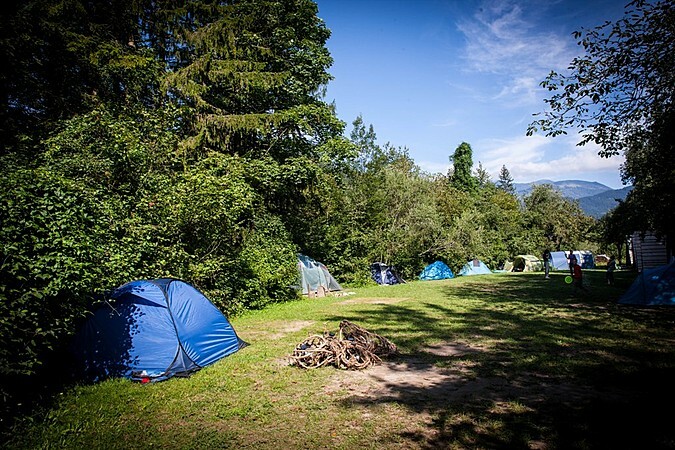 The camp is located near the Alpine river Savinja, not far from the amazing Logar valley. It will delight families with young children, people who love peace and quiet and those who like some adrenalin in their life as well. A great place for your unforgettable adventures in Slovenia! The special feature of the NaturPlac is the singular kočura, a wooden hut in which you find a tent, equipped with a mattress, pillows and bed sheets. You don't need your own equipment for camping; your bed has already been made! You can put up your own tent as well, or even borrow a sleeping bag if you want to spend the night gazing at the stars and sleeping in a hammock among the treetops. Besides the camping area there is a meadow for different social activities, a badminton and beach volley court, a slackline course and a mini library. The beautiful Alpine river Savinja runs right next to the camp and on the riverbank you will spot a big rock that gave the camp its name. The hot summer days are definitely lively here! Guests have access to a wooden kitchen, a shared dining area and an outdoor fire pit for different events and a pleasant chat around the fire. The place is ideal for tasting the local culinary specialities, which can be prepared for you by the hospitable camp staff on your demand. The camp is run by a group of nature lovers and sports enthusiasts who will be happy to advise you on exciting trips nearby or organize guided activities for you – be it in water: canyoning, kayaking, rafting; on ground: hiking, mountaineering, climbing, mountain biking or caving; or up in the air while paragliding. They also organize variously themed workshops, including art workshops, for children. The shelter of the trees and the sparkling flow of the river Savinja will enchant everyone who is looking for unforgettable holidays in Slovenian nature.